Harry Gurney's son Arthur loved watching his dad win with the Melbourne Renegades on finals day. Olly Stone is making his England debut - and it's thanks to another player's upcoming wedding. A host of teams from Worcester are hoping to hit new heights for charity later this month with a match of 'Street Sixes' softball cricket. The club's pre-season photo shoot was held on the only bit of grass which wasn't totally covered by flood water. India spinner Ravichandran Ashwin will play county cricket for the first time after joining Worcestershire until the end of the season. 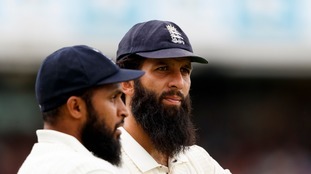 Worcestershire's Moeen Ali takes a hat-trick against South Africa to give England the win in the third test. Nottinghamshire bowler Luke Fletcher has been ruled out for the rest of the season after being hit on the head with a cricket ball. It happened during the club's T20 match against Birmingham Bears at Edgaston on Saturday when the batsman smashed the ball straight back at him. He was taken to hospital but was released on Sunday. Medics said he was lucky to have escaped a more serious injury. Belgrave Road was blocked off as rival supporters came out onto the streets following Pakistan's victory over India in the cricket.